Financial Powers of Attorney in WV – West Virginia Senior Legal Aid, Inc.
Financial powers of attorney can be inexpensive, flexible tools for authorizing someone else to manage your money and property, but they can also be abused by financial exploiters. 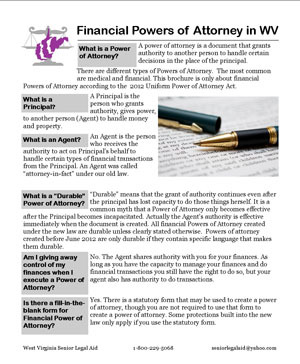 In 2012 the Uniform Power of Attorney Act became effective in WV. This brochure describes how powers of attorney work under the new law. It is a .pdf file that prints on one sheet of legal size paper, front and back.